All State Board Results 2019: In India, board exams are referred to the public exams which are conducted for the students of Class 10 & 12. Class 10 exams are also known as the Secondary School Leaving Certificate Exam or SSLC exam and Class 12 exams are known as Higher Secondary Certificate or HSC exams. Each state in India has their respective state boards which are the conducting authority of Class 10 and Class 12 board exams. Apart from the state boards, there are other boards, like Central Board of Secondary Education (CBSE) and Council for the Indian School Certificate Examination (which conducts the Indian Certificate of Secondary Education, popularly known as ICSE). All these exams are conducted every year between the month of February and April. After that, the results of the respective state’s board exams are declared. All state board results for both HSC & SSLC will also be announced on the official website by the respective state boards. In this article, we will provide you with all the necessary links to check your 10th and 12th board exam results , that is all board exam results. Read on to find out. How To Check All State Board Results? Step 1: Visit the official website of your board. Step 2: Click on the link provided to check your Class 10 or Class 12 board results. Step 3: Enter your Roll Number as mentioned on your hall ticket/admit card. Step 4: Click on “Submit”. Step 5: Your SSLC/HSC exam results will be displayed. Step 6: Download and take printouts for future reference. 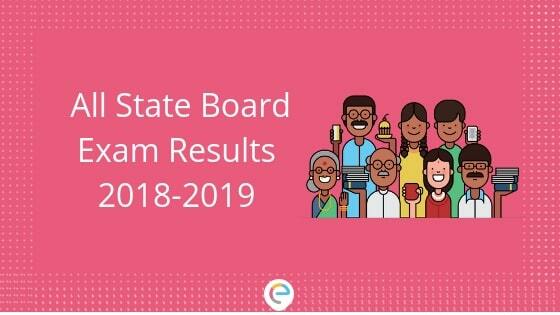 Now you are provided with all the information regarding All State Board Results 2019. Remember, Class 1o and Class 12 board exams are the two most important exams of your life. So, give your best shot in the exam. Prepare in a manner that guarantees a high score so that you can get into the best institutes for the program you want to pursue. Solve Class 10 practice questions and Class 12 practice questions for Physics, Chemistry Biology and Maths on Embibe for free, and take your preparation to the next level. We hope this article helps you. If you have any doubt regarding this article, drop your comments below and we will get back to you at the earliest. Sorry, Ramshe, we don’t have products for VTU university but you can check out our products such as VITEEE, TS EAMCET, MHT CET, AP EAMCET, JEE Main, NEET, AIIMS, JIPMER.